Last August I reported that I’d bought a rolling pet carrier that looked really good — Creature Leisure’s Pet Pilot XL. For one reason and another I only tried it out a couple of trips ago. Here’s what we thought. Things we liked: This is, indeed, a very well-made carrier. The zippers and mesh are sturdy, and the carrier rolls solidly — not a wobble to be seen. It cleverly expands with a zipped gusset, and the interior structure and padding unfold to create a supported larger space for your dog. In the picture to the right, I’ve unzipped the gusset during a layover, and Chloe’s poked her nose into the gusset corner. That huge mesh panel near my left leg is on top when the bag is under an airplane seat, so I had good access to Chloe, and she could see me easily. Things we didn’t like: The downside of solid construction is weight, and this is a heavy carrier. Chloe and her bag were weighed for the first time on our most recent trip (we were using a different carrier), so although it’s rare, it does happen, and a 10 lb. carrier may cause you trouble. The gusset is brilliant, but once you’ve unzipped it, you have to unzip the main opening to the carrier, reach your hand in, and pull the interior structure and padding away from their normal position to support the newly-expanded space. An antsy dog will try to wiggle out of the carrier during this maneuver. The Pet Pilot XL is also, generally speaking, oversized. In use, however, it squeaks under plane seats — and it looks so trim that ticket and gate agents didn’t give it a second glance. On balance, it’s a great carrier. I don’t anticipate using it much in the future because it’s just a bit too small for Chloe. On a trip that lasted over a couple of weeks in different locations, we gave it several test runs, and by the end she really resisted getting back in. I recommend it wholeheartedly for dogs 10 lbs. and under. I really appreciate your reviews of these items – you explain things so clearly that I can decide, based on your description, what will and what won’t. work for me. Thank you! Thank you so much, Mary! I appreciate the feedback, and I’m glad that what I’m posting is helpful. It’s ridiculous. I’ve never flown with Frankie but I covet all the products you review! Just in case, I guess… I agree with Mary, you’re providing a great service. When I do get up the courage to try flying with Frankie — I’m afraid his insulin needles will get confiscated — I’m going to go back over all these great write ups. I’ll bet you and Frankie would sail through — people can bring insulin and needles with them (http://www.tsa.gov/travelers/airtravel/specialneeds/editorial_1374.shtm ), and I’m confident that if you had a letter from your vet explaining the situation, Frankie could too. Heck, if Frankie’s under 10 lbs., I’ll give you Chloe’s Pet Pilot XL (vacuumed thoroughly, I promise). What I love is your honesty. A lot of reviews don’t always give the full picture. I like that you are not afraid to offer some criticism. This way we get the full scoop on the product. Thank you for this honest review. I travel with my rat terrier quiet a bit and have longed for a rolling carry on rather than schlepping the her in the sherpa, I feel like I need a sherpa after I am done. Weighing in at 17 lbs, I know after reading your blog that this would not work for us. I am grateful that Nami is a good traveler, because she is adjusts to her sherpa very nicely, it is me who yearns for a different experience. Your site looks very interesting. I look forward to checking out you other categories. 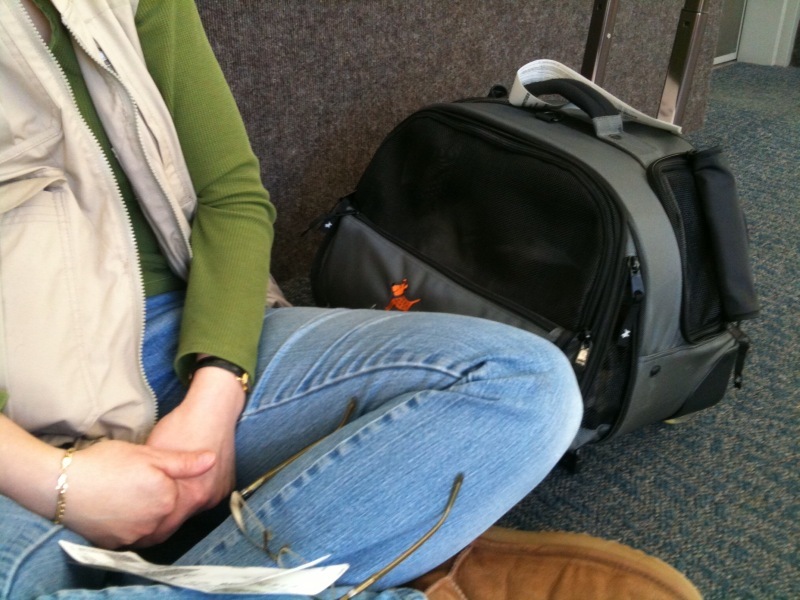 I would love to have my dog–a Chloe too!–get adjusted to this bag! We recently flew to San Francisco from Seattle and we used the SturdiBag. It was quite the experience! No one checked her and there was barely a fuss over her! No one even knew we had her! The trip there was much easier than the trip back, since on the way back we had an hour and a half delay, no fun! We flew Alaska and we had to press down the top of the bag for it to fit under the seat. There are three areas under the seat in first class so it was nice that my mom and I had these seats since we could easily have two bags each and still have a spot for Chloe. Hopefully we can look in to this bag as I would love to use it! Thanks for an amazing review and a great blog that is incredibly informative! The only thing that makes me nervous about this bag is the weight, I’d be terrified they would weigh it! It would be a risk for sure! Thanks so much for the report, Mackenzie, esp. since I don’t fly on Alaska! If you do get the Creature Leisure bag for your Chloe, please let me know what you think of it. It is heavy, but the fact that it’s well-made and rolls is very, very tempting. Thanks to the judicious reviews here, I bought the Creature Leisure Pet Pilot and have used it on several cross-country flights with my 8 lb. Coton. It’s sturdy and wheels well, though just a tiny bit big for reliable underseat placement (should you get, as we did, a reconfigured seat with rows too close to allow a hard-sided carrier to swing under the seat, or one stuffed with audio equipment that interferes with the Pet Pilot’s clearance. Under these circumstances, only a soft-sided carrier will do.) I solve this by using a soft sided purse-type carrier as my knitting and magazine bag. If the Pet Pilot won’t fit, I pop it into the overhead, put my dog in the purse and just dump the rest of my junk in the seat pocket. I’m tempted to ditch the Creature Leisure and just bring the purse, but it’s handy for an elderly or handicapped person to use in the airport, very subtle in restaurants, comfortable for the dog, etc. I’m thinking about investing in the Timbuk2 Muttmover when my cheap dog purse splits. Seems as though no single carrier meets all needs or all dogs. Thanks so much, Mary Rose, for your thoughtful comment — and for the fine idea of carrying an alternative, back-up bag in case of need. I have to go back to my country Venezuela and want to take my schnauzer that weighs 20 pound. I have no idea wha kind of carrying case to use I know it depends on the plane but something with wheels would be much better since Denver and Miami have long walks… and I refuse to send him with the luggage! Thanks for your help! Hello, Isabel — I’m sorry to be so horribly late in responding to you. You’ve likely long since returned to Venezuela and forgotten all about your inquiry, but just in case — a 20 lb. dog is at the upper limit of what will work in-cabin on a plane, so your carrier options are limited. Your best bet would be the XL SturdiBag carrier (do a search for it on the blog, and you’ll see some posts about how several readers have made it work for them and their large small dogs). For wheels, I’d suggest using a pet stroller (do another search for more details) and checking it at the gate, just as folks do with their baby strollers. I hope that helps! I would recommend a SturiBag. A black one…looks like a gym bag, has flexible sides and top. If you get a dog stroller, you can use that to make your way through the airport, put the Sturibag inside the stroller. At the gate, check in the stroller, carry the Sturibag into the plane.